Some decades ago, a controversy burst out about the moral flaws of the Belgian-born comics character Tintin and its creator, Hergé (Georges Rémi). The initial stories were accused of stereotypical racism, gratuitous violence on animals and even fascism. Hergé defended himself saying that he was the product of the heavily prejudiced society surrounding him in his youth. Truth is, we could just as well point our fingers to the thousands of artists, thinkers, writers, scientists, politicians, doctors, you name it, which came up with prejudiced, offensive, damaging, or otherwise preposterous theories in the 20th century alone. It didn't take long before someone noticed how stereotypical and prejudiced the depiction of the Portuguese Oliveira de Figueira was in Tintin’s stories. Oliveira de Figueira (a funny name, even in Portuguese) is a travelling salesman, fat and bald, who sells just about anything just about everywhere, no matter how dangerous the place. He keeps popping up and always manages to sell Tintin this world and the next one. While I recognize his character as strongly stereotypical, I sympathize with the man. He isn’t violent. He isn't rude. He doesn’t sell weapons. He isn’t even rich. He doesn’t bother me at all. 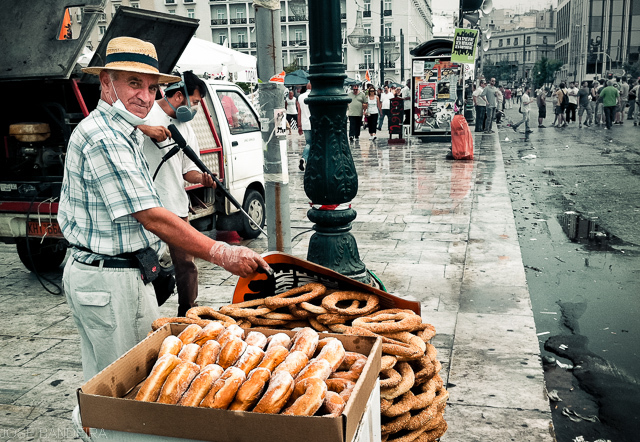 Watching this Greek vendor at Syntagma Square, Athens, during the mid-2011 turmoils, I couldn’t help but remembering Oliveira de Figueira. He was selling his cakes in the square as calmly as if he was at the entrance of a circus or at a beach resort, ignoring both the relative danger of being caught between the police and demonstrators and the fact that the ever-present gas simply would not dissipate, even days after it had been spread. His cakes were all but protected from the gas, and still he used plastic gloves to pick them. He didn’t really belong in the scene: like Oliveira de Figueira, he just happened to pop-up in there. De Figueira! Como pude enganar-me? Abraço de volta, Anónimo, e obrigado.